Acrolinx makes some striking claims. followed by a very impressive collection of client logos. The Acrolinx platform helps the world’s greatest brands create amazing content at scale. Content that’s on-brand, on-target, and drives results. 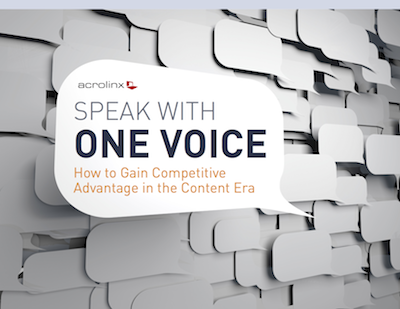 Built on an advanced linguistic analytics engine, we have the only software platform that can actually “read” your content and guide writers to make it better. Overall the copy is well written; very well written indeed. Interesting, however, that the team did not pushed their own concepts of 'voice' (or 'tone') and localisation to ensure that readers based outside the United States see a version with their preferred spellings, capitalisation rules and other locale-specific tweaks. Even the top all-caps headline yells, IMHO, in a voice born in the USA. Surely these details come under the broad concept of 'voice'. 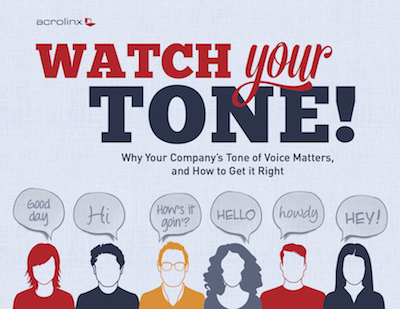 Watch Your Tone!, Why Your Company's Tone of Voice Matters, and How to Get it Right (register for free download here) by Ann Handley, Chief Content Officer at MarketProfs and author of EVERYBODY WRITES, Your Go-To Guide to Creating Ridiculously Good Content. Several romance languages are undergoing or have recently undergone huge changes with regard to pronoun usage. Schematically, the older forms can sound hopelessly old-fashioned to the young while the newer forms can be a huge turn-off for older readers. How does Acrolinx software deal with these issues in these languages? Even assuming that Acrolinx software does everything the company claims, well written copy like that on the Acrolinx site is expensive to produce, especially on the scale required by large corporations. The localisation of this type of documentation into target languages written to the same high standards regarding style, voice, clarity, etc. is also very challenging, especially at scale. This challenge is compounded by unrealistic client expectations as to cost and turnaround, which, in turn, are often based on the unrealistic claims of the leading high-volume suppliers. So far, the Acrolinx site has failed to convince me that this has been thought through with sufficient rigour. I will continue to study the Acrolinx site and documentation and post my thoughts as I proceed. For further information on the differences between the voices/tones adopted in the annual reports of French and American corporations see Unexpected Differences between French and American Corporate Communications by Amanda Williams for the The Open Mic blog. Amanda also discusses how difficult it can be to sell 'change of voice' arguments to FR-to-EN language service clients in France.